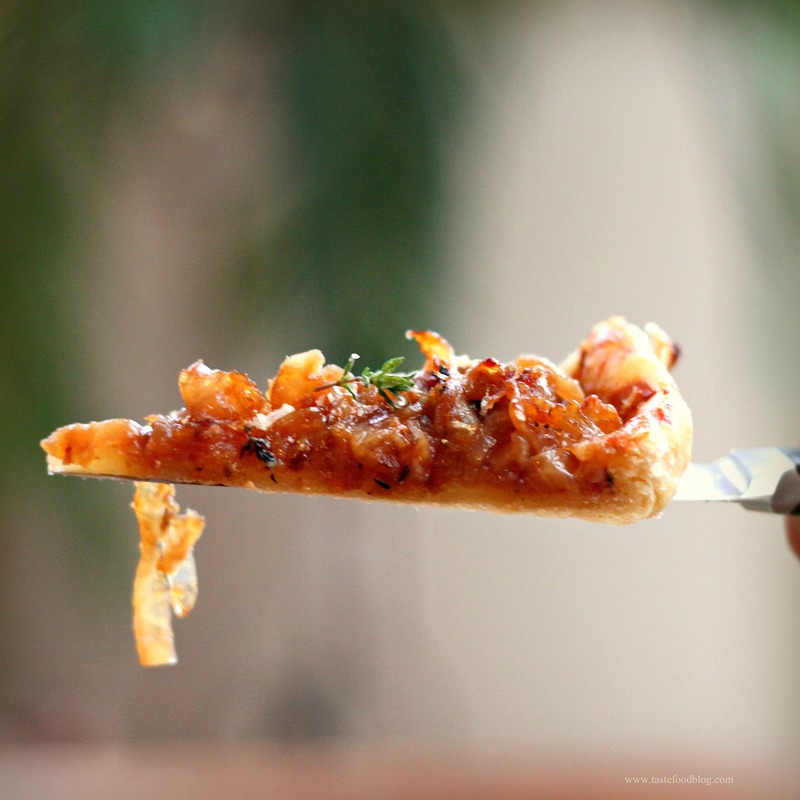 This tart is a vehicle for caramelized onions. It’s also inspired by an appetizer I ate years ago in a Swiss auberge overlooking the Lake of Geneva, near our home at the time. It’s been so long, I don’t remember the name of the restaurant, but I do remember the onion tart. It was simple and rustic, just like the half-timbered dining room with its open fire where we tasted it. As we settled into our deep chairs and read the menu, our kir royales (champagne and creme de cassis) would arrive, accompanied by a complimentary sliver of tarte d’oignon. Sweet, rich and minimal, this tart was perfection in its simplicity. Today I make a version of this memory and enjoy another view from our California home. It’s so rich that I like to serve it a similar way, cut in thin slivers, served with a glass of wine. Heat olive oil over medium heat in a deep skillet or pot. Add onions and salt. Cook onions, stirring occasionally, until they are golden brown, soft and squidgy, about 30 minutes. Add port wine and cook, stirring, 2 minutes. Remove onions from heat and stir in the pepper. Cool slightly. 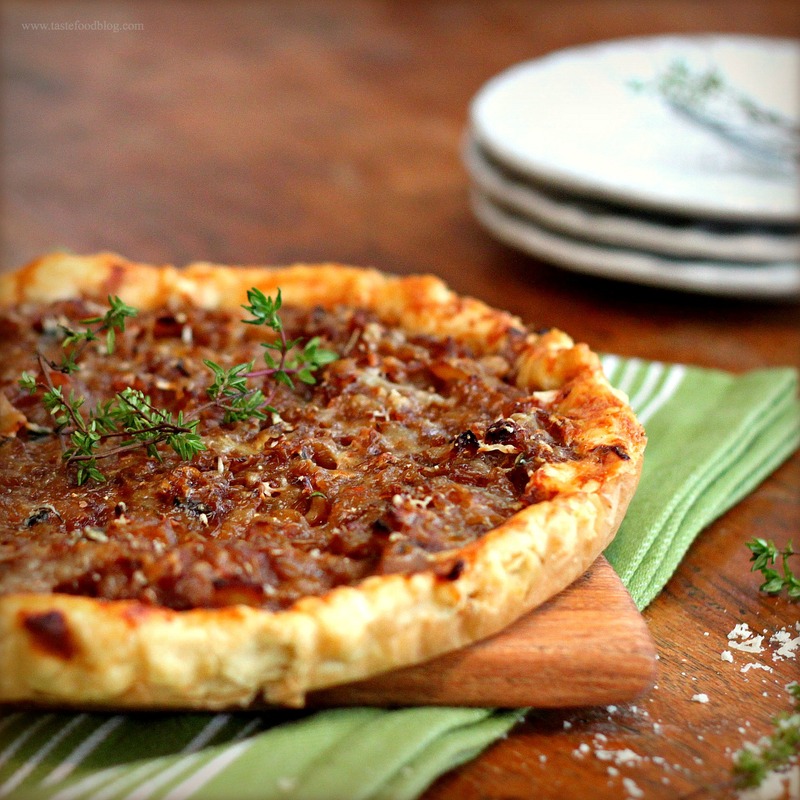 While the onions are cooling, roll out the dough to fit in the bottom and up the side of a 10-inch round tart tin. Sprinkle half of the cheese over the bottom of the tart. Spoon onions into the shell and spread evenly. Sprinkle 1 teaspoon thyme over the onions. Brush the exposed crust rim with the egg wash. Sprinkle the tart and crust with the remaining cheese. Bake in a preheated 375 F. oven until the crust is firm and golden and the onions have turned a rich golden brown, without blackening, about 30 minutes. Remove and cool slightly. Serve slightly warm or at room temperature garnished with thyme sprigs. What a gorgeous tart! My beloved husband unfortunately is very sensitive to onions, so I tend not to cook much with them, but I would love a piece right now! the second photo is particularly beautiful! Now when you caramelize an onion, I will always show up. Delish! Mmmhhh, fabulous! This tart looks ever so droolworthy. Great choice of toppings. Wow, that tart looks spectacular! Better than any garlic bread or other similar starter! This is absolutely one of my very favorite dishes. Seriously, I could eat it for eternity. The port wine is such a great addition – I’ve never considered it before. Oh Lynda, caramelized onions are the best! We have a lunch place here that heaps caramelized onions on on all their sandwiches and I always order a side container of them to eat. Your tart looks perfect for our fall days. I had trouble tearing my eyes away from that last photo of yours! I’m sorry, but a thin sliver of this would NEVER do. didn’t have any on hand.